2010 ended up being quite a year and I finished on a real high qualifying for the Ironman World Championships. Nonetheless, 2011 is lining up to be a good one, fingers crossed!!!!! 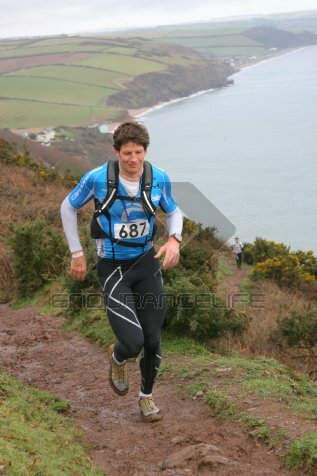 First race of the year was an ‘Endurance Life’ 28 mile coastal run down in Devon. I did this race last year with a few friends and took it relatively easy. This time round I thought I would put a bit more effort in and end up 53 minutes faster. OK, I was putting in a little more effort but I was still taking it steady and enjoying the view, so was very surprised to be almost a whole hour quicker!! Because of the staggered start I had no idea of my position. In hindsight maybe I should have pushed the pace just a little harder as I ended up 10 seconds of a podium place and only 1 minute off second place. To be honest this type of race is just about getting out there and not really about position. Kind of what I love about them. I took to warming up for this on my rollers inside the village hall, chatting to some really friendly guys organising the race. The relaxed atmosphere and good conversation meant I almost missed my start time. Doohoo. Anyway, I made the start on time and got stuck in. To be honest I found the speed I was going at a little un-nervy and held back a bit, simply because I did NOT WANT to go any faster. I was feeling a bit of a wimp! Anyway, 47 minutes and a few wheel slides later I had finished the first TT of the year. I was happy with the average power output of 366W over the 21 mile hilly course and felt I could have comfortably maintained that for a good while longer. It turned out I won the thing and was very surprised to be receiving 1st place prize money! Something I was most definitely not expecting. The following Saturday I had entered into the Brill 31 mile hilly TT. After my win in the TT last weekend my legs were still feeling a little heavy. This course involved 2500ft of climbing over the 31 miles and since climbing on the bike is most definitely not my strength; I was not expecting too much from this race. It was a stunning beautiful day with not a drop of wind, perfect to rip it up around the Oxfordshire countryside. As always when it comes to racing, I am stupidly optimistic about my limits and went out from the start HARD. After 20mins my average power was 400 watts and I was feeling strong. At the 45 minute mark this had dropped off to an average of 390 watts and I was starting to hurt. The last 30 minutes of the course was relatively flat. Funnily enough, this was the part of the course I found the toughest. It felt doable to hold 400 watts on the hills, but on the flat it seemed infinitely harder. The race finished with a tough climb up to Brill and I gave it everything crossing the line in 1hr 14mins and an average power of 381 watts. Happy with that, I rolled back down the hill to where I had parked, quickly got changed into my running kit and headed off for an hour run. I had expected my legs to be totally shot, but to my amazement, they actually felt great. I was coasting along at 4mins/km pace without a care in the world. After my 4th place in the early season coastal run and these two time trails wins, things were looking good. This is where you should take five, rest and recover. That is precisely what I did, well for 3 days any way. Four days after the TT I did a MAX Test (increasing 20 watts every minute until failure), intrigued to see what numbers I would get back from it. I hit 500 watts! 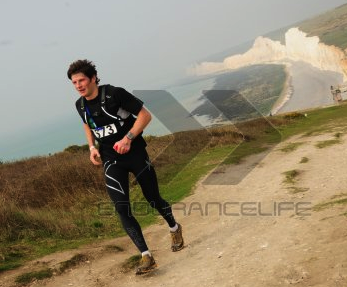 To follow the max test I was up at 4am on Saturday, heading to the white cliffs on the south coast for another endurance life coastal marathon. Another beautiful day and a stunning course around the UK countryside. Just one problem. After about 20 minutes of running my legs felt like they were at the end of a marathon, but I still had about 38ish km left. I struggled around the 27 mile course and 4700ft of climbing, but to be honest found it really tough going. Some might argue that I should not really have done this race, given how tired my legs felt at the start. However, running a marathon with tired legs is what doing an Ironman is all about, so in a weird kind of way, this race was perfect training for later on in the year. I crossed line in 10thplace, totally shattered but glad to have stuck to it out on the course. The atmosphere at these events is always good and it was nice to enjoy some good banter while I soaked my legs off in the sea. Man it was cold in there and I just hope it warms up a bit before May and my first triathlon of the year.